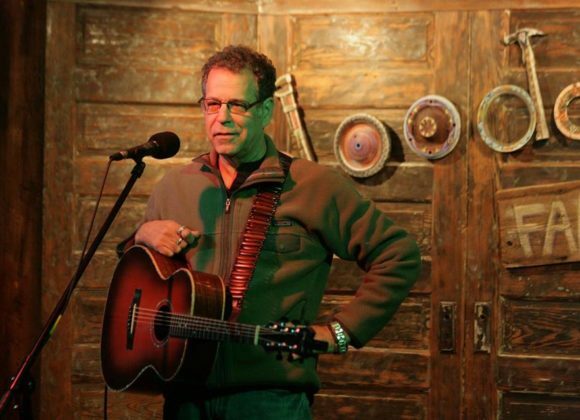 These are just a few of the reasons the ACMA is excited to be hosting Cliff Eberhardt! He brings with him his friend and special guest to open the show Louise Mosrie. Here’s Cliff’s bio: Cliff Eberhardt knew by age seven that he was going to be a singer and songwriter. Growing up in Berwyn, Pennsylvania, he and his brothers sang together and their parents played instruments. His dad introduced him to the guitar and he quickly taught himself to play. Fortunate enough to live close to the Main Point (one of the best folk clubs on the East Coast), he cut his teeth listening to the likes of James Taylor, Joni Mitchell, Bruce Springsteen, Howlin’ Wolf, Muddy Waters, Bonnie Raitt, and Mississippi John Hurt — receiving an early and impressive tutorial in acoustic music. At the same time, he was also listening to great pop songwriters like Cole Porter, the Gershwins, and Rodgers and Hart, which explain his penchant for great melodies and clever lyrical twists. In 1990 Cliff’s song “My Father’s Shoes,” appeared on Windham Hill’s Legacy collection, leading to a deal with the label. They released Cliff’s first album, The Long Road (1990), a work featuring a duet with Richie Havens. The critical response to this debut was outstanding (The Philadelphia Inquirer called the album a “repeatedly astounding collection”). He followed with two more records on Windham Hill before releasing 12 Songs of Good and Evil (1997) on Red House Records, which stemmed from a chance meeting with Red House founder Bob Feldman at John Gorka’s wedding. Cliff recorded two more albums before his critically acclaimed The High Above and the Down Below, named the #5 album of 2007 by USA Today. Produced by legendary musician and Red House Records president Eric Peltoniemi, it was recorded in Minneapolis with noted jazz players Gordy Johnson, J. T. Bates and Rich Dworsky and was his first album after spending several years recovering from a car accident. With a new lease on life and a fresh batch of songs, Cliff embarked on what has turned out to be an artistic renaissance. Recorded in the Texas Hill Country, Cliff’s 2009 album 500 Miles: The Blue Rock Sessions may be his finest to date. An intimate album of powerful originals and unique covers, it features a reworking of his hit “The Long Road,” a song made more poignant after nearly two decades of touring and recording. Long one of the most respected songwriters on the club scene, his peers often mine his catalog for themselves. Cliff’s song “Memphis” was included on Cry Cry Cry, an album of collaborative covers by the “folk supergroup” of the same name (comprised of Dar Williams, Lucy Kaplansky and Richard Shindell). Other performers who have recorded his songs include Richie Havens, Shawn Colvin, Russ Taff and Buffy Sainte Marie. A collection of his songs has been published in The Cliff Eberhardt Songbook (Cherry Lane Publishing). In 2011, Cliff got a phone call from the Folger Theatre and Shakespeare Library in Washington DC. They had been listening to his song, “That Kind of Love” along with director Aaron Posner and got the brilliant idea to hire Cliff to write original songs for the Shakespeare classic “The Taming of the Shrew”. It would be set in the old West – Deadwood style – and Cliff would be cast as the blind but wise old saloon singer bookending scenes with his poignant songs and guitar phrases. The play was a huge success and won much critical acclaim across town and 7 weeks of solid sold-out shows in the Spring of 2012. In 2013, Cliff was awarded a coveted Helen Hayes Award for Sound Design and the cast won for Best Ensemble. Some of the songs on Shrew Songs are from Cliff’s past work and some are brand new. The stripped down production enhances the immediate intimacy of Cliff’s songwriting. You don’t have to have seen the play to love this record! It’s available for sale now only through this website or at Cliff’s shows. Louise Mosrie grew up in the small town just outside of Nashville, TN on a farm with British parents and several siblings – riding horses, writing poetry and singing with the radio. After college in Knoxville, she “borrowed” her brother’s Sears guitar, bought a simple chord book and started writing songs. The early material was mostly acoustic pop as she tried to channel her English roots while listening to Everything But the Girl and The Sundays.